Heat oven to 350°F. In 10-inch skillet, melt butter over medium-high heat. Add steak strips; cook 8 to 10 minutes, stirring frequently, until no longer pink. Remove steak from skillet; place on plate. Add bell pepper and onion to skillet; cook about 5 minutes, stirring occasionally, until crisp-tender. Return cooked steak to skillet; mix well. If desired, add salt and pepper to taste. Unroll 1 can of dough onto ungreased cookie sheet, firmly press perforations and edges to seal. Press or roll into 13x7-inch rectangle. Spoon heaping cup of steak mixture in 2-inch-wide strip lengthwise down center of dough to within 1/4 inch of each end. Sprinkle 1/2 cup of the cheese over steak mixture. Make cuts 1 inch apart on long sides of rectangle just to edge of filling. For braided appearance, fold strips of dough at an angle halfway across filling with ends slightly overlapping, alternating from side to side. Fold ends of braid under to seal. On second ungreased cookie sheet, repeat with remaining can of dough, steak mixture and cheese. Brush braids with beaten egg. Bake 16 to 22 minutes or until golden brown, switching position of cookie sheets in oven halfway through baking. Cool 1 minute; remove braids from cookie sheets. Let stand 5 minutes before serving. Cut into slices. 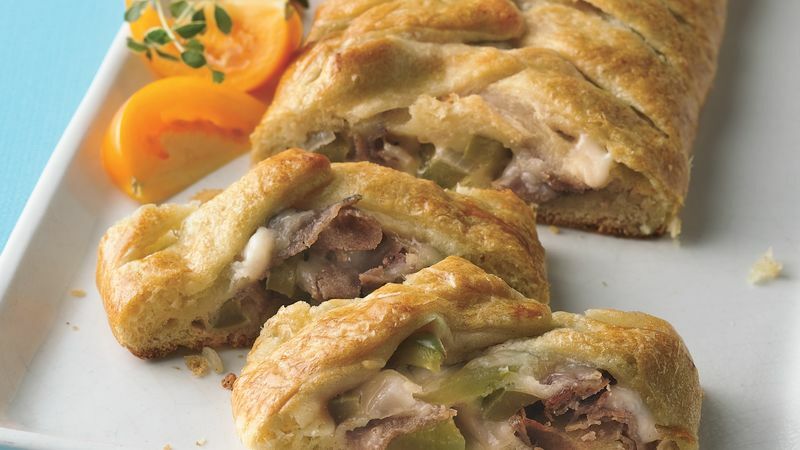 For a small family, cut the recipe in half and use one can of crescent rolls. Bell peppers, whether green, red or yellow, are all rich in vitamin C.